Welcome to Skilifts.org. The site was originally founded as NW-Skilifts.com by Bill Wolfe; a former lift operator, as a site about lifts and lost areas in the Pacific Northwest. Since its inception, the site has moved out of the Northwest and become more of a site dedicated to lifts in general. If you are an individual who is looking for information about how lifts work, you have come to the right place. If you are in the lift industry, this is the place to look for information, links to manufacturers and lift-related companies, and other lift technicians to swap ideas and techniques. Please browse the site and check out the discussion forum. We are always looking for more information and members; feel free to submit information and/or join the forum. As of February 22, 2011, we currently have over 2,200 forum members with over 800 of them being industry employees. 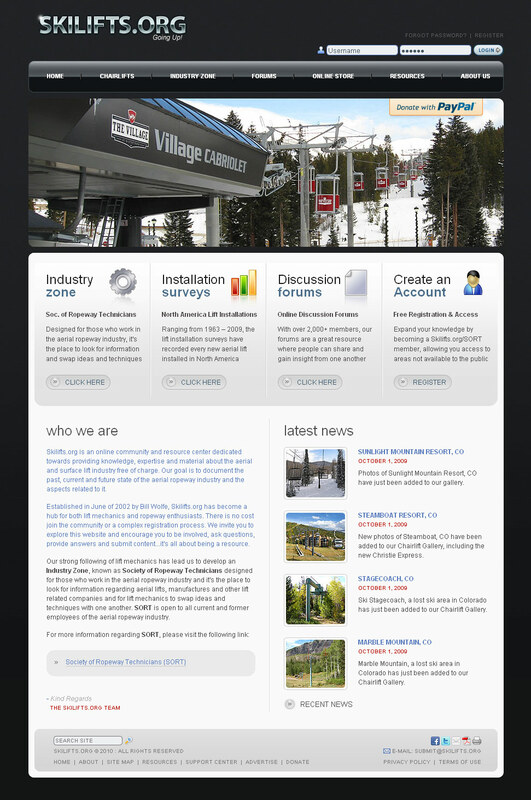 Feb 22, 2011 - The new website, referenced as Skilifts.org V 2.0 is still in development and has a long road ahead of it before it's launched. We have been focusing the majority, if not all of our time on the new website and have somewhat put the current web site on hiatus. At this time, we are currently in the process of resizing all of our photos which is taking a lot longer than we ever anticipated. However, Skilifts.org is not dead and our online discussion forums are still very active and alive in participation. Thank you for your patience in regards to this matter. Saddleback Ski Area, ME added. Okemo Mountain and Sunday River updated. 2008 Lift Installation Survey added. Pats Peak Ski Area added. © Copyright 2002-2008 by Skilifts.org -- All Rights Reserved.